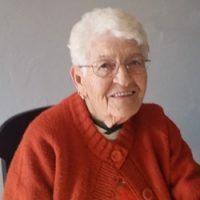 Eunice Merna Shearer McFarland, age 87, passed away peacefully in her sleep on the morning of February 5, 2019 at her home in Sunnyside, Utah. She was born on September 26, 1931 in Somerset Colorado to Elvin “Red” and Ada M. Shearer. Growing up, her family was the traditional coal mining family of the era, moving to wherever her father could find work. Coming from a family of two daughters, her older sister Norma took on the role of helping with the household chores such as cooking and cleaning, while Eunice took on the responsibilities of helping her Dad with the firewood, hauling coal, hunting, fishing and any other “tomboy” duties that he could think of. Eunice would also help the family situation by assisting her Mother at the Peach and Cherry orchards packing and picking crates or doing whatever other job was available. Her parents also taught her a deep sense of patriotism and pride in her country, shown by her shedding tears each time that she heard the national anthem. Prior to graduating from Carbon High School in 1949, her family moved to Dragerton, Utah where she would meet what came to be the love of her life, Floyd R. McFarland. They were married in Reno, Nevada on June 4, 1955. Together, they raised three daughters and two sons in a family full of love, support, hard work and laughter. Eunice was raised to work hard and play harder. As well as being a Wife, Mother, Grams and Great Grams to anyone and everyone, there was no job that she didn’t give her all to. She worked everywhere from butcher shops, grocery stores, jewelry stores, malt shops and school cafeterias before retiring from the tarp shop as a seamstress in 2004. In her free time, she was up for anything. She was adventurous and free spirited. In her younger years, camping, fishing and hunting were among her favorite hobbies. She loved all types of music and would take any chance to dance her heart out with any partner, including her sister-in-law, June Stevenson. Other hobbies close to her heart were travelling with friends and family, toll painting beautiful figurines and special Christmas ornaments, attending family sporting events and special occasions, collecting antiques, visiting with friends down at the Senior Center and supporting her Denver Broncos. Her favorite hobbies, however, were watching western movies and reading western novels because it reminded her of her favorite cowboy, Floyd. Following her last relocation to East Carbon in 1993, Eunice became devoted to her time spent in the Catholic Church. She was once chosen as Woman of the Year by her fellow parishioners at the Good Shepherd Catholic Church. From attending mass, helping with services, contributing to bake sales and enjoying Saturday nights at Bingo, she enjoyed every minute of her commitment to God and Church. Eunice, Mom, Grams, and friend to all will be deeply, deeply missed. She lit up any room that she entered with her outgoing personality and sense of humor. For us, the hole that she leaves in our hearts cannot be filled. We can only rely on the many stories, photos and recipes to carry on her incredible legacy. She is preceded in death by Parents, Elvin and Ada Shearer; Sister, Norma Coltrain; Husband (and Cowboy), Floyd McFarland; Daughter, Tara Ruane; Daughter, Jana Johnson; and Granddaughter, Amanda McFarland. Survived by Daughter, Gema Riley of East Carbon; Son Todd (Cheryl) McFarland of East Carbon; Son and Caregiver Greg McFarland of Sunnyside; and Son-in-law Mike Johnson of Price. Eight Grandkids: Audra (Mike) Patron; Adrian Kyle (Tori) Abeyta; Amber Seppi; Arrin (Rob) Rackstraw; Austin (Chris) Cowan; Tony (Amy) McFarland; and Alyse (Andrew) Johnson. She was also a proud Great-Grandmother of 18. Thank you to Larine at CNS and Amy at A Caring Hand. Also, we would to send a special thank you to Terri Stevenson along with the many nurses and staff at Rocky Mountain Hospice.